Recent discussions of sinus tarsi syndrome (STS) describe this entity as primarily an instability of the subtalar joint due to ligamentous injuries that results in a synovitis and infiltration of fibrotic tissue into the sinus tarsi space. The sinus tarsi is a tunnel between the talus and the calcaneus that contains structures that contribute to the stability of the ankle and to its proprioception but can get damaged in the sinus tarsi. The joint between the talus and calcaneus is also known as the subtalar joint. This articulation includes 3 facets: an anterior, middle and posterior facet. Variation in structure of those facets affects the stability of the subtalar joint. 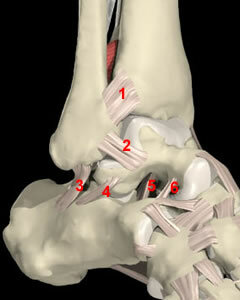 This joint is also composed of the the extrinsic ligaments (calcaneofibular and deltoid ligament) and the intrinsic ligaments(the interosseus, the talo-calcaneal ligament (number 5 in figure 1), the cervical ligament (number 6 in figure 1)) and the medial, lateral and intermediate roots of the inferior extensor retinaculum. which all provide extra stability to the articulation. Ruptures of the intrinsic ligaments allow increased movement of the subtalar joint that may result in instability. Akiyama suggested that the sinus tarsi is not only a talocalcaneal joint space but a source of nociceptive and proprioceptive information on the movement of the foot and ankle and that sinus tarsi syndrome may result from disorders of nociception and proprioception in the foot. Mostly the sinus tarsi syndrome occurs after a traumatic lateral ankle sprain or multiple ankle sprains (mostly due to a weak anterior talofibular ligament) which consequences result in injuries to the interosseus and cervical ligaments. The ligaments of the sinus tarsi can be sprained or torn, and an inflammation and hemorrhage of the synovial recess in the sinus tarsi can occur. This happens in 70% of the cases. This pathology is mostly a result of synovitis and infiltration of fibrotic tissue into the sinus tarsi space due to an instability of the subtalar joint, caused by ligamentous injuries. The sinus tarsi syndrome can also occur as a compression injury, for example to people who have flat or pronated feet. The talus and calcaneus are pressed together as a result of the deformation. This causes bone to bone contact of the talus and calcaneus, with inflammation or arthritis in the sinus. The characteristics of the syndrome are pain at the lateral side of the ankle. “The pain is most severe when standing, walking on uneven ground or during the movements of supination and adduction of the foot'.” People suffering from the sinus tarsi syndrome also have a feeling of instability (functional instability) in the hind foot. When the syndrome is a result of an inverted ankle sprain there is a major chance the lateral collateral ligaments of the ankle are also damaged, since the ligaments in the sinus tarsi are the last ones to tear with a traumatic ankle sprain. Moreover the loss of stability in the ankle will allow a greater range of motion to our subtalar joint. This execessive movement will increase the forces onto the synovium and across the sinus tarsi. It is this subtalar joint synovitis whom is responsible for chronic inflamation and infiltration of fibrotic tissues in the sinus tarsi and results in ankle pain. Furthermore those injuries can also dammage ligaments of the tibiotallar and talocalcaneal joints and increase the mobility between the talocrural and subtalar joints. Diagnosis of the sinus tarsi syndrome is usually made by excluding other foot pathologies. CT-scans exclude bone fractures, but are not specific enough to diagnose STS. The most commonly used methods are MRI’s. MRI findings may include filling of the sinus tarsi space with fluid or scar tissue, alterations in the structure of the ligaments or degenerative changes in the subtalar joint. Magnetic resonance imaging (MRI) is the best method to visualize the structure within the sinus tarsi, especially the interosseous and cervical ligaments. The MRI findings may also include alterations in the structure of the interosseous and cervical ligaments and degenerative changes in the subtalar joint. Cadaveric study results indicate that initial and reconstructed MR arthrograms along and perpendicular to the ligament axes are potentially useful for further evaluation of individual tarsal sinus structures. A full ankle examination is required and it should be compare with the other ankle. An acute ankle injury will typically present with pain accompanied by swelling, ecchymosis, and tenderness in the anterolateral ankle. Because the synovitis and fibrotic tissues associated with STS will take time to develop, athletes with injuries to the subtalar joint may not initially have symptoms that can be localized to the sinus tarsi. In standing posture the patients may demonstrate a pes planus posture or an asymmetry of the rearfoot angle with the leg. In passive examination, the range of motion of the ankle may be limited in pronation and supination, but pain over the sinus tarsi at the end range of plantar flexion combined with supination is a typical sign for STS. The subtalar joint may have increased translation mobility if the interosseous and cervical ligaments are disrupted, but this is not always the case. The therapist should examine the talocrural and subtalar joints for signs of hypermobility as injuries can affect both of these important articulations of the lower extremity. Localized ankle discomfort to the sinus tarsi space and feelings of instability with pronation and supination movements of the subtalar joint will help identify STS. The therapist should also evaluate if there is any muscle weakness of the peroneal and plantar flexor muscles. This is done with resistance tests of the ankle: pronation tests and flexion tests. The treatment of the sinus tarsi syndrome can be conservative or operative. The first one includes physiotherapy (see physical therapy management), injections with corticosteroids in the sinus tarsi, local gels or drugs. Operative treatment is also very effective in most cases, but needs to be considered as a last resort if conservative treatment fails. STS can be treated by open surgery and subtalar arthroscopy when conservative treatments are ineffective. Kuwada reported a long-term treatment results of STS where all patients who underwent open excision during a 15-year period were reported to achieve 100% pain relief, and there were no complications. Lowy et al. reported that 15 of 21 STS patients who underwent open surgery achieved complete pain relief and that the remaining 6 achieved partial relief. Moreover, Frey et al. reported that, among 21 STS patients, 43% had an excellent result and 43% had a good result after subtalar arthroscopy; only 3 patients (14%) had a poor result. Thus, according to these studies, open surgery and arthroscopic treatments produce similarly satisfactory results. Notable is that arthroscopic treatment alone resolves the symptoms of STS as well as open surgery, which involves the excision of all synovial tissue in the lateral contents of the sinus tarsi. Subtalar arthroscopy has been reported to be associated with complications of neuritis, sinus tract formation, and superficial wound infection, although these responded to nonsurgical treatment. Since the STS often occurs after an ankle sprain, the foot has been immobilized by a brace or tape during recovery of the joint and the ligaments. Therefore mobilization of the ankle, especially of the subtalar and talocrural joint is necessary in the treatment of STS. Joint mobilization exercises should be done in all directions, but especially in pro- and supination. Also important is they should be executed at full range of motion, provided there is no pain provocation. “'No random control trials for the efficacy of a rehabilitation program for STS are available'.” To influence the tissues in the sinus tarsi, the therapy may consist of friction massages, electrotherapy (for example ultrasound), laser-therapy, cryotherapy and other types of deep massages. The use of ice massage over the lateral ankle may be useful to diminish inflammation and pain. Activities should be started as soon as possible, if they can be done without pain. As the peroneal muscles and Achilles tendon tend to weaken when having sinus tarsi, it’s vital to adjust a program therapy to reinforce those muscles. Flexion of the ankle by standing on the toes is a good exercise, and when done on the edge of a stair eccentric exercises can be done for a better strength gain. Stability training is the last stage of the rehabilitation. The patient must do proprioceptive exercises, for example lunges, to improve the proprioception and stability in the ankle. Training programs to improve the stability of the subtalar joint and lower extremity function will be the hallmark of treatment plans for STS. Joint stability relies on passive joint structures, dynamic muscular responses, and neurological control. The sinus tarsi syndrome is a foot pathology, mostly following after a traumatic injury to the ankle. It may also occur if the person has a pes planus or an (over)-pronated foot, which can cause compression in the sinus tarsi. Some characteristics are pain at the lateral side of the ankle and a feeling of instability. Diagnosis of the sinus tarsi syndrome is usually made by excluding other foot pathologies. Magnetic resonance imaging (MRI) is the best method to visualize the structure and theirs alterations within the sinus tarsi. Stability of the subtalar joint is assessed with medial and lateral subtalar joint glides performed by moving the calcaneus over a stabilized talus in the transverse plane and with subtalar joint distraction. In passive examination, the range of motion of the ankle may be limited in pronation and supination, but pain over the sinus tarsi at the end range of plantar flexion combined with supination is a typical sign for STS. Furthermore the muscle force has to be evaluated for a weakness of the peroneal and plantar flexor muscles. The treatment is very effective in most cases, but needs to be considered as a last resort if conservative treatment fails. STS is then treated by open surgery and subtalar arthroscopy. STS often occurs after an ankle sprain. Therefore the foot is immobilized by a brace or tape during recovery of the joint and the ligaments. Due to this event mobilization of the ankle, especially of the subtalar and talocrural joint is necessary in the treatment of STS. Joint mobilization exercises should be done in all directions, but especially in pro- and supination. Also important is that they should be executed at full range of motion and with no pain provocation. ↑ Akiyama K, Takakura Y, Tomita Y, Sugimoto K, Tanaka Y, Tamai S. Neurohistology of the sinus tarsi and sinus tarsi syndrome. J Orthop Sci. 1999;4(4)p:299-303. ↑ Roemer FW, Jomaah N, Niu J, Almusa E, Roger B, D'Hooghe P, Geertsema C, Tol JL, Khan K, Guermazi A. Ligamentous Injuries and the Risk of Associated Tissue Damage in Acute Ankle Sprains in Athletes. Am J Sports Med. 2014 Jul;42(7):1549-57. ↑ Lektrakul N, Chung CB, Lai Ym, Theodorou DJ, Yu J, Haghighi P, Trudell D,fckLRResnick D. Tarsal sinus: arthrographic, MR imaging, MR arthrographic, andfckLRpathologic findings in cadavers and retrospective study data in patients withfckLRsinus tarsi syndrome. Radiology. 2001 Jun;219(3):802-10. ↑ Thermann H, Zwipp H, Tscherne H. Treatment algorithm of chronic ankle andfckLRsubtalar instability. Foot Ankle Int. 1997 Mar;18(3):163-9.